Training and capacity building of teaching and supporting staff is an integral part of Door Step School's journey towards ensuring 'Education for All'. Through Parivartan Training Center, we are able to identify and meet training needs of not only our own staff, but also of teachers and facilitators from other organizations and schools. 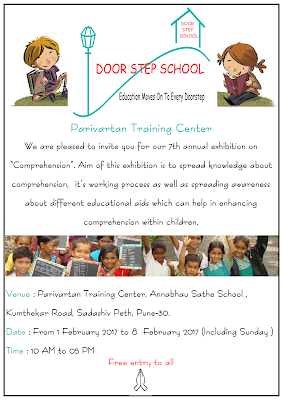 As a part of continuous learning and sharing process, Parivartan Training Center organizes an open-to-all exhibition on yearly basis. Topics covered under the exhibition so far include - brain development and types of intelligence, how to make reading a fun activity, what is an ideal classroom, project method of teaching concepts, etc. The topics are presented in two ways - from academic research findings perspective as well as practical implementation and its challenges and solutions. This is the seventh year of Parivartan's annual exhibition and this time we have focused on the foundation of any learning process, that is Comprehension. We understand that comprehension is an internal process and the speed and level of comprehension differ from person to person, in our case - from child to child. It is important for every teacher to estimate how much of the content children are able to comprehend. We, at Door Step School, have been developing innovative tools for children and teachers to explore this concept from multiple perspectives. This year's exhibition will showcase these concepts and tools about comprehension. Where: Door Step School's Parivartan Training Center, Annabhau Sathe School, Kumthekar Road, Sadashiv Peth, Pune. For whom: Teachers, parents, students, educationists, and anybody interested in the learning process of children.